An indoor/outdoor paradise, this cozy 2,500 square foot family home has it all. The house enjoys full integration through Savant Systems including audio/video, lighting control, comfort and surveillance. All equipment is centralized in a custom built garage media cabinet and features eight zones of video and fourteen zones of audio. The outdoor area sports two zones of video with an 80″ 4K TV in a garage-door-styled controlled niche and four zones of audio to cover the patios and sport court. The client is able to trigger any combination of all integrated components via the scenes option in Savant app. For this sports family, Savant provides the soundtrack of their lifestyle. 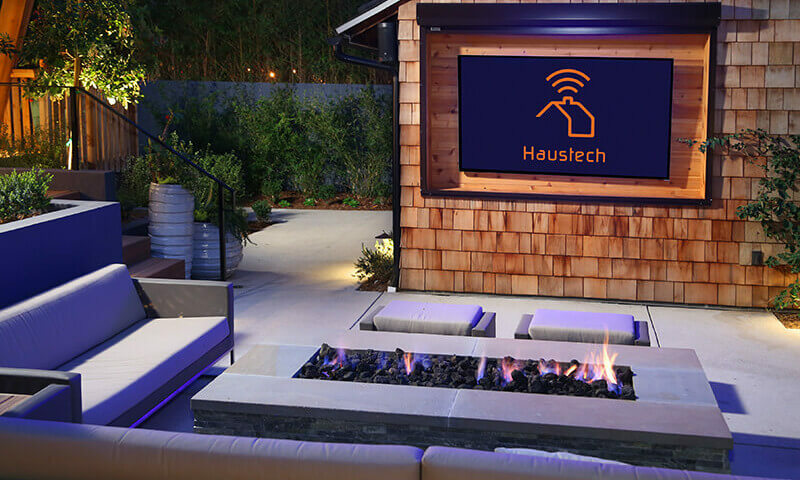 This 10k square foot new construction project allowed Haustech to go for full integration of every element and customize it to the client’s lifestyle. This is truly a connected home with eighteen zones of audio and eight zones of video to full lighting control, surveillance and integration of twelve zones of comfort (HVAC), a Panasonic phone system with three gate intercoms plus security. The client was an audiophile who appreciates the control and acoustic qualities of the Sonance and Episode Signature Series speakers. 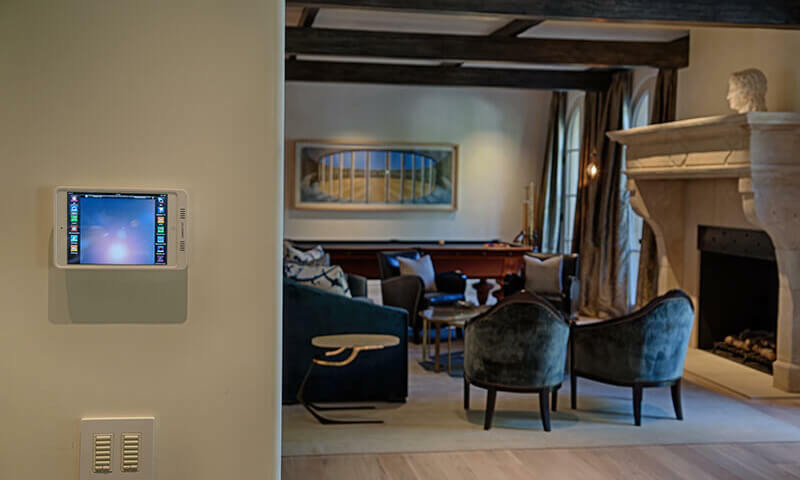 Control throughout is provided by multiple LaunchPort iPad docks which provide the ability to have an on-wall control point with a capability to remove the touch panel for roaming interfacing as well. 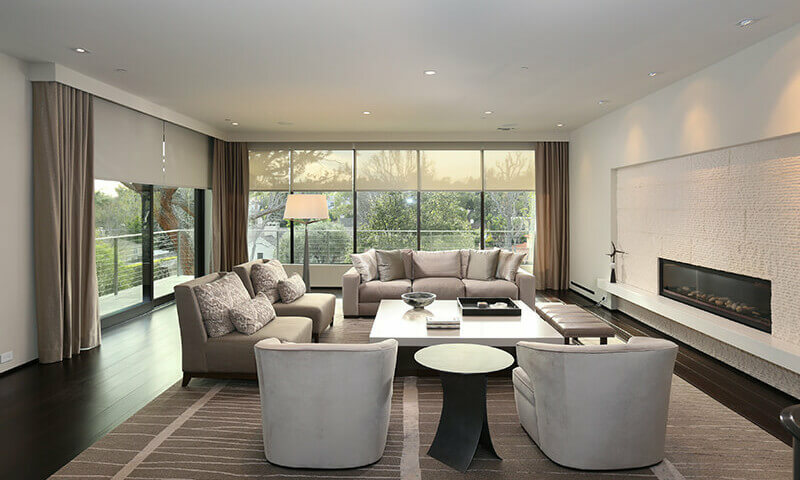 This 9k square foot Smart Home in Pacific Palisades enjoys full integration via Savant including whole house audio/video, lighting control, comfort, pool control, security and surveillance systems. 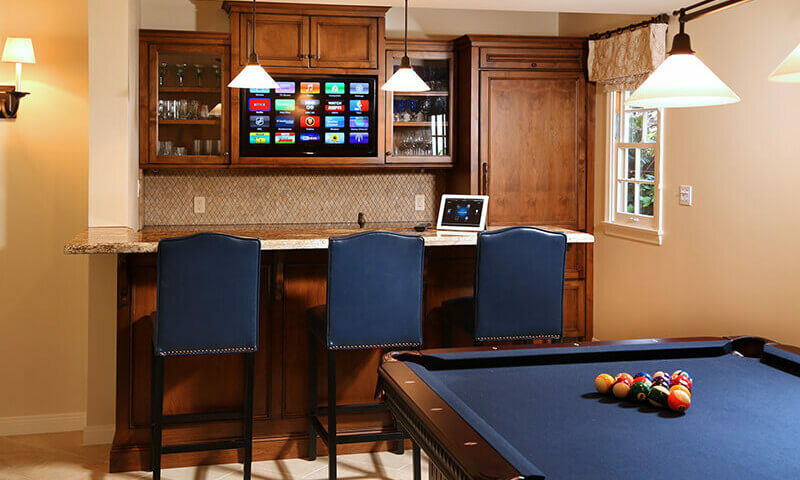 The system can be controlled by multiple iPad mini LaunchPorts throughout the home, Savant remotes at the TV Locations and other iOS devices. The owner can even access the house remotely, including access to Savant interface, surveillance and answering the door from anywhere in the world. 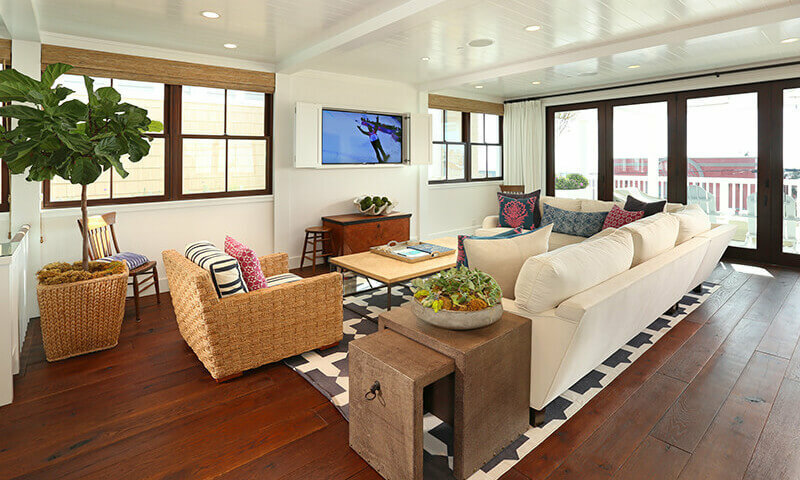 The home has eighteen zones of audio and seven zones of video, with sources including four DIRECTV DVRs, three source Kaleidescape system, two Apple TVs, BluRay and Savant two zone audio server. Plus, various audio/visual aesthetic technologies exist throughout, from a 75″ VisionArt covered TV with 7.2 surround sound, to TV lifts, to an 8’x8′ Seura Mirror hiding a 46″ Samsung TV. This client wanted an economical solution for full integration of this 8K square foot home. Haustech determined that Savant Systems would offer a great balance between functionality and budget. The system was completed with full audio distribution to 13 zones and localized video sources for each television. What is interesting in this case, is that the audio for each source is run through the savant system audio matrix so by all appearances the audio and video are all centralized. Coupled with integration for lighting, security and comfort control, this turned out to be a completely modernized Savant Pro System. What started out as a master suite and foyer makeover turned into a renovation of this entire residence over five years. 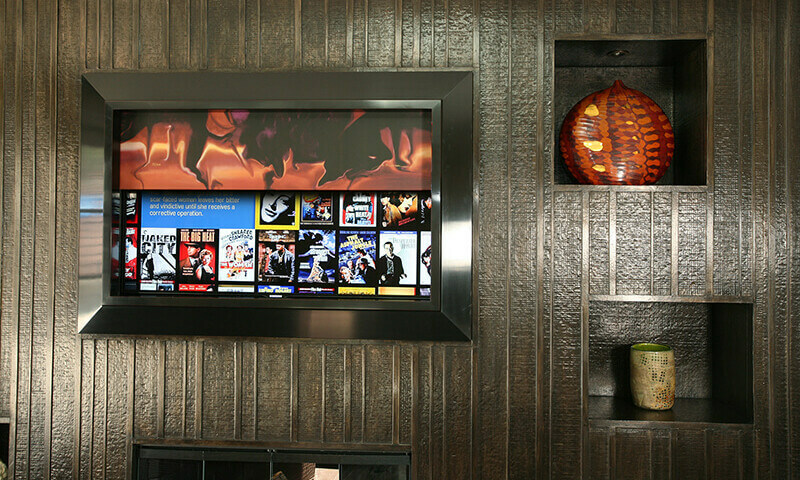 The entire house is connected via Savant and enjoys 21 zones of audio and 11 zones of video with access to Kaleidescape, AppleTV, Roku, DIRECTV and BluRay throughout the home. Many of the systems (comfort, pool control and security) were integrated as they had not been before and can be controlled locally or remotely via IOS devices or iPads and iPad minis LaunchPorts. 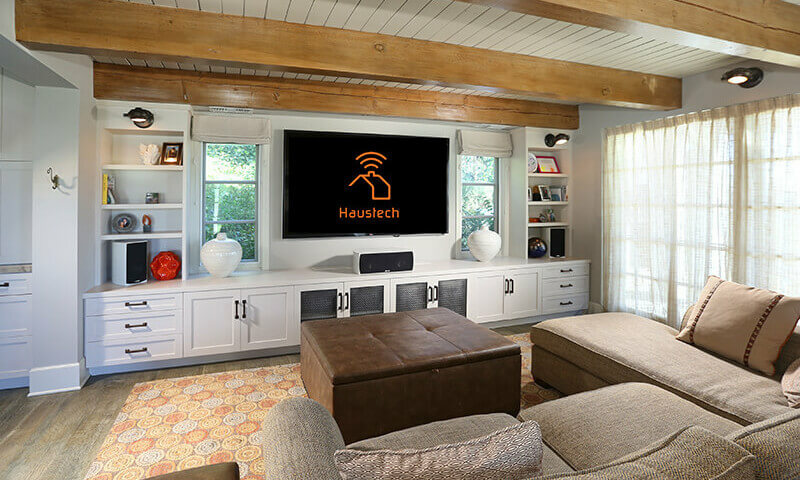 Since the client did not want any technology visible in the house unless in use, Haustech was able to get creative with lifts/mirrors/paintings to hide all the televisions. For a house jam packed with technology, you would never guess it! This is a “Smart Home with a View” that was built as a spec home in the Mar Vista hilltop, a suburb in Los Angeles. Haustech was brought in to incorporate technology within a certain budget while leaving much room to customize in the future. We installed a robust control system that included audio/video, lighting control, comfort, pool control and a dedicated home theater. Upon completion, the house was advertised as a Smart Home and quickly sold above asking price within two days. 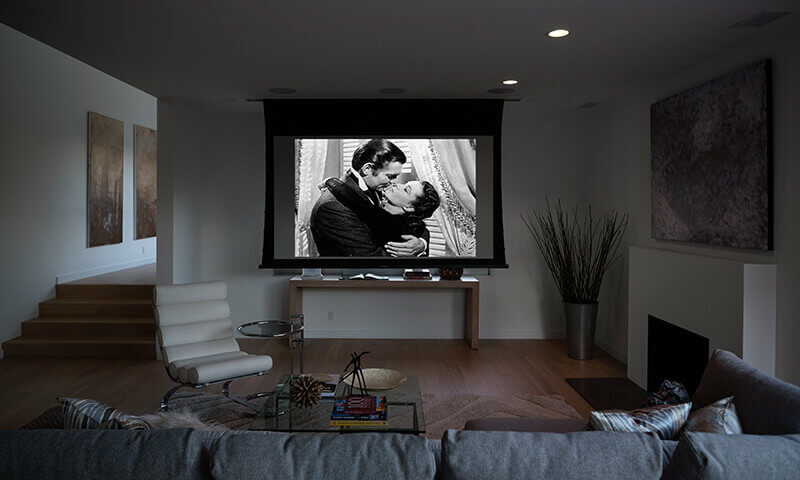 This West Los Angeles home was a complete retrofit installation, utilizing the limited existing wiring present in what was originally built as a spec home. All equipment was relocated to the basement out of the way of the limited storage space in this 4,500 square foot house. By centralizing everything, we were able to provide full video distribution to seven zones and audio to nine (speakers were wired throughout.) In addition, Haustech installed a surveillance system, comfort control and integrated access control via Savant. The project will continue for phase two pool integration and an additional structure. The control system features integration of lighting control, five camera surveillance system, two Sonos Connect Players, enterprise grade wired and wireless network, SynJ phone system, two Apple TVs, four DIRECTV DVRs and a BluRay DVD player. Plus, due to the way Haustech pre-wired, the home has full potential for doing much more in the future. 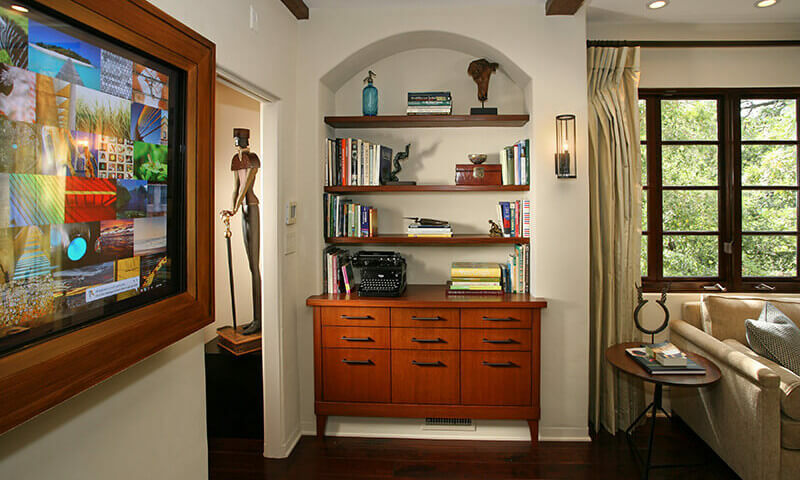 This client dreamed of having a space for entertaining family and friends that also included a guest quarters. With the creation of a fully connected Pool House, their dreams arrived. Haustech set up four zones of video, six zones of audio and lighting/comfort integration for a fully customized experience. 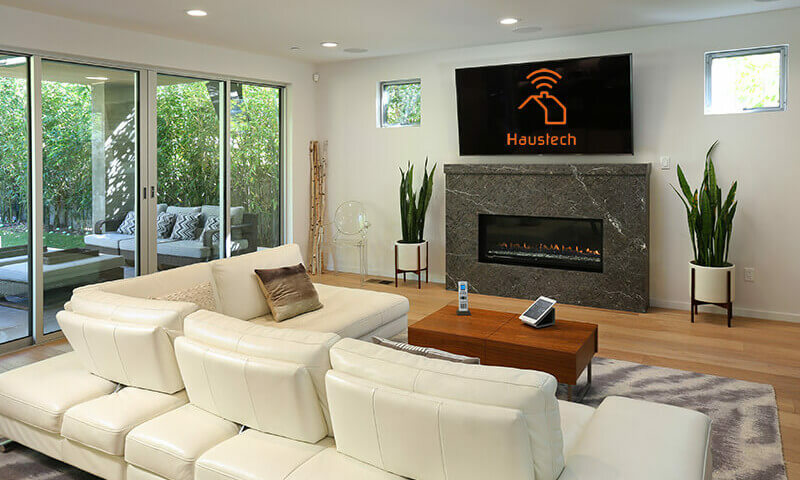 For the 2012 Pasadena Showcase House of Design “Writer’s Retreat,” Haustech created a first of a kind 60″ touch screen television that operates much like an iPad. Surf the web, check email, watch television, work on documents – all with the touch of a finger. The Writer’s Retreat also features in ceiling surround speakers and state-of-the-art controls.